It is my pattern testing. It looks messy but if you notice, all at it’s place precisely. 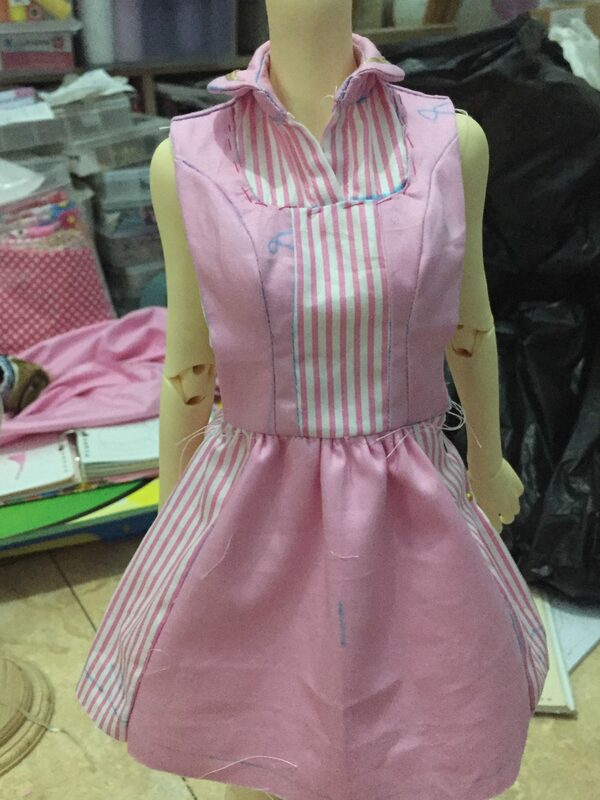 So, it gives a whole picture about my pattern on doll body. 1. Use the fabrics we are going to use. Of course, if there is expensive one, use cheaper but the texture and thickness are most close enough. Thickness and texture is important especially when we are going to make gathers. It will give different adjustment to the pattern and appearance effect. 2. Mark precisely, even on lining fabric. 3. Sew on marking precisely. 4. Some sewing and fiinishing techniques may be simplified. It is OK if it’s minor. Unless it may give a big effect on the appearance. don’t simplify the sewing technique. If you notice, my gathers wasn’t done consistently like left and right sides looked different 😅. Yet, it is gathered correctly, yet, not neatly (the pattern needed a minor correction to achieve neat purpose and i have corrected it for next time). The collar was sewn correctly although looks not neat, yet, i sew on marking as precise as possible. 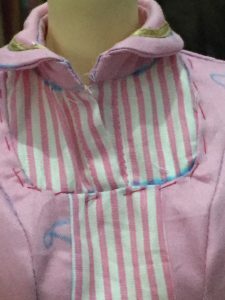 The fabric lines pattern top and bottom didnt meet or in-line but i sew correctly on marking pen. The ribbon on collar was also done on marking pen. I didn’t just sew it. I really serious when sewing it. It is also part of testing and practicing. May be looks like a small thing but for me, it is a very importamt small detail to be paid attention for. This is my priority, too. I still want to improve the collar shape but i’m not sure if it will be good idea or not. I will add frill on collar like the illustration depicts. The collar width should be good enough for now. The major bet i did may be that i didn’t use interfacing on collar which resulted a good idea of not using it. It looked better! While making this, i also learned fee things to be corrected and improved for next time sewing. I didnt have to think ALL when i just wanted to test my pattern. The priority is different! I wanted to know the fitting. 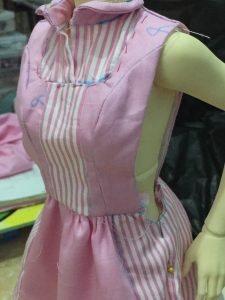 If it was good, then i started to think more about correcting and improving few things to get a very best result on next time sewing. REMEMBER: the priority when testing pattern is different. Use our time efficiently and effectively. My tips can be a start yet think of your situation for your project and make a priority list of your own when testing your pattern.